I like meat, I like sauce - so here is meat sauce. Sometimes it would be nice if blog posts that simple would fly. I know some people dearly wish they would but no such luck in this case. You have to endure either the reading or the scrolling past the rambling to get to the actual recipe. The truth is I like the writing part because through it I hope to share a bit of my life/neurosis with you (mostly the latter). But back to bolognese sauce. This bolognese sauce is good - no, it’s great! It’s a foolproof recipe that was born in my cast iron skillet several years back. If you’ve been following me for a bit, you know well that I have a bit of an infatuation with my cast iron skillet. I’m sure this sauce would turn out perfectly fine in any other pan but for me it’s cast iron all the way. There’s something inexplicable about it; the way it infuses each ingredient it touches with an almost ethereal quality. Here I go again, professing my love for my cast iron skillet. But seriously if you haven’t gotten your hands on one, it’s a worthy investment. One you’ll forever treasure. But as usual I’ve digressed. This time, really back to this bolognese sauce. Any recipe that starts with bacon has to be good, am I right? And if there’s wine involved, I’m pretty much going to burst into song and dance. In my opinion these two ingredients make any dish spectacular. It doesn’t have to be a fancy, expensive wine either, just one you would want to actually drink. I learned that early on from the experts. Good wine makes good food. This speedy bolognese is a hearty recipe you can make on any weeknight. Traditional bolognese is cooked slowly for hours but I’ve decided to make a speedier version that’s heavenly every single time. And if you have a food processor in your possession, you’re in luck. Sure you can cut the vegetables by hand and enjoy the process while doing so, but on a busy weeknight a few pulses of the food processor are a welcoming aid. You have a few options for what to serve this sauce with. 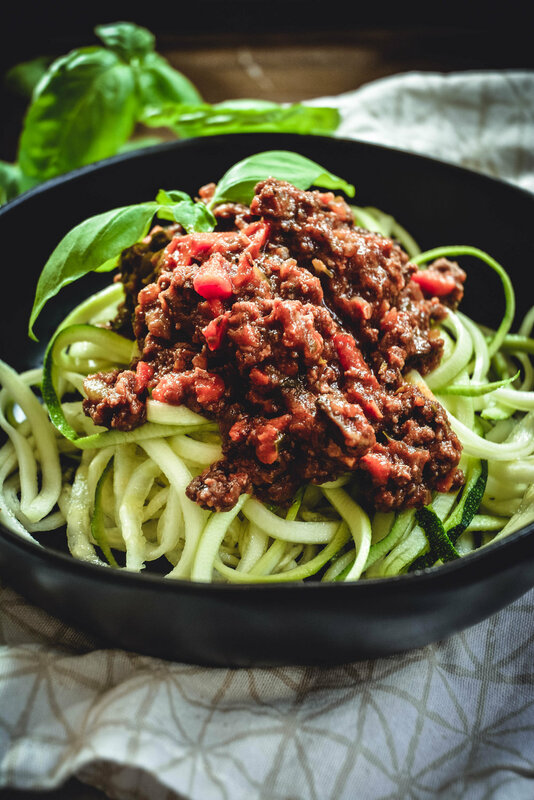 If you’re not paleo or whole 30, you could go with rice pasta or regular but I like sticking with zucchini noodles as they work exceptionally well with it. 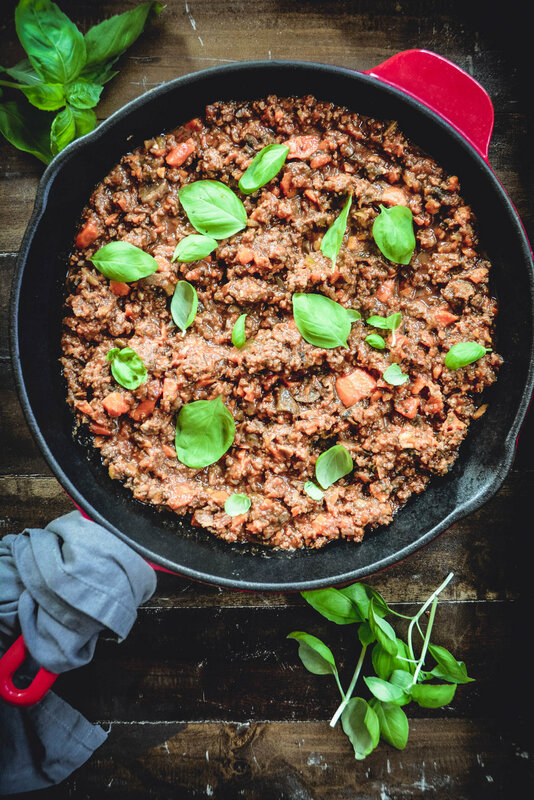 So grab a glass of wine for the bolognese, one for yourself and get cooking! In a food processor, add carrots, onion and celery and pulse a few times. You still want to be able to recognize the vegetables. Small but not granular is ideal. (Alternatively chop all vegetables small by hand). Preheat cast-iron skillet over medium heat. Add bacon and cook until crispy. About 3-5 minutes. Remove bacon from pan and place on paper towel lined plate and set aside. In the same pan, add onion, carrot, celery and 1/4 tsp salt cook for about 5 minutes until soft. Add garlic and cook for 30 seconds. Add beef, stirring contentiously and breaking it up into smaller pieces. Cook until browned (about 8 minutes). When meat is fully cooked, add wine and turn heat up to scrape any bits off the skillet. Cook until most of the wine is evaporated. Add tomato sauce and paste, oregano, mushrooms, salt, pepper and coconut sugar. Add bacon, basil, parsley and lower the heat to low. Let cook for 25 minutes stirring occasionally. If you want to thin out the sauce, feel free to use some or all of the broth. But this is optional. I like my sauce thick. Heat frying pan, 1 tbsp of oil olive oil and add zucchini noodles. Cook for 1-2 minutes on medium heat, stirring continuously. The noodles should still have a bite to them just slightly softened. To assemble, place zoodles on plate, top with the bolognese sauce and add additional basil if you so desire. This will pair exceptionally well with a Nebiolo or Pinot Noir.